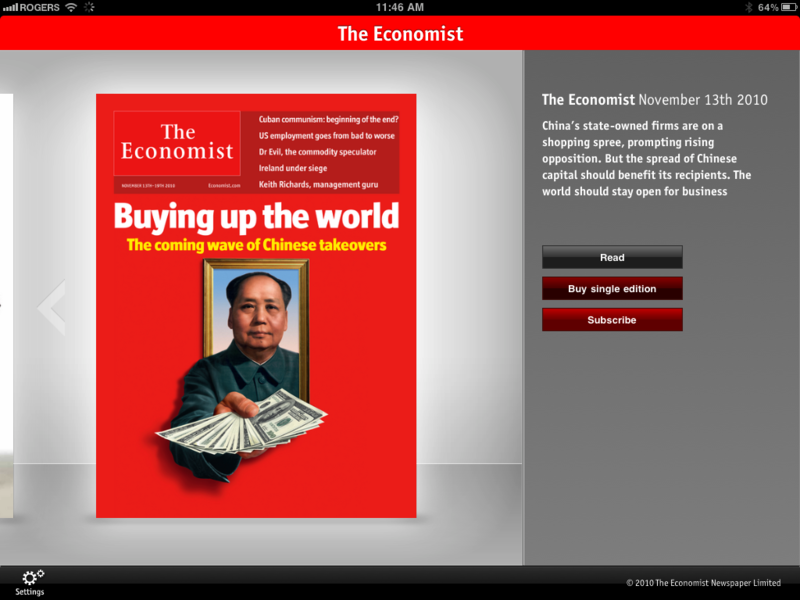 The Economist (s pso) today released an iPad and iPhone (s aapl) edition of its magazine. The app itself is a free download, but in order to access actual issue content, you need to either be a subscriber or purchase issues individually for $5.99 each. I ran the iPad app through its paces to see how it stacks up. First, it’s that you don’t have to put down any money to try things out. An “Editor’s highlights” selection of content is available for each issue. The preview actually contains a lot of good content, so it might be enough for casual users. Once you’ve downloaded an issue, you can choose it by tapping the cover from the main screen, which presents you with the table of contents. Categories are listed on the left and specific articles on the right. It’s a good index — simply designed and easy to use — though I wouldn’t mind seeing an article synopsis along with the headlines in the right-hand column. Articles are opened by tapping on them, and they are presented as a series of pages you flip through, instead of scrollable text. It’s a reading style choice that works well with magazine content, though I’d prefer an option to turn on continuous scrolling, too. You can “turn” pages all the way through the magazine, if you wish, and full-screen ads will appear between some articles. 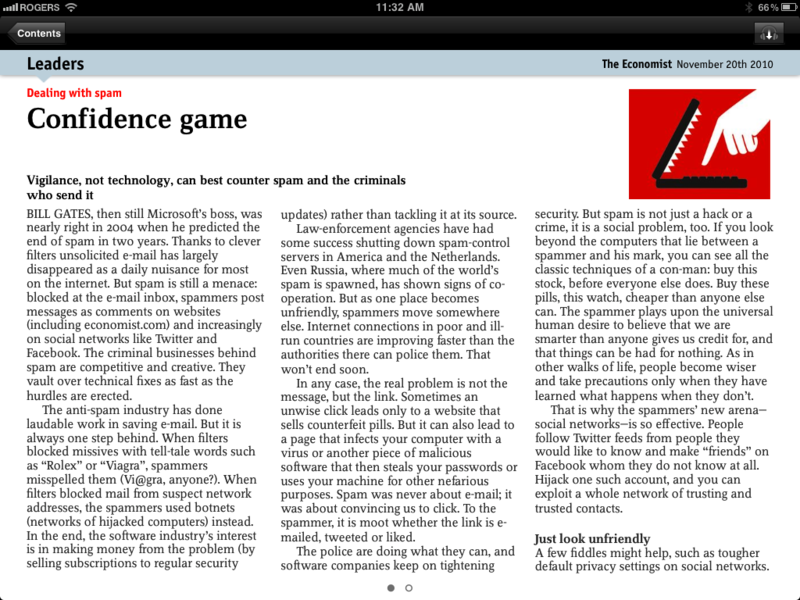 The Economist gets that part right: ads don’t appear inline in actual articles. Once downloaded, the content is available for offline viewing, including an audio version of the magazine read by professional newscasters available via a button at the top of the interface that’s present in every UI view inside an issue. The audio version is a nice value-add feature that you don’t see very often in digital magazines. 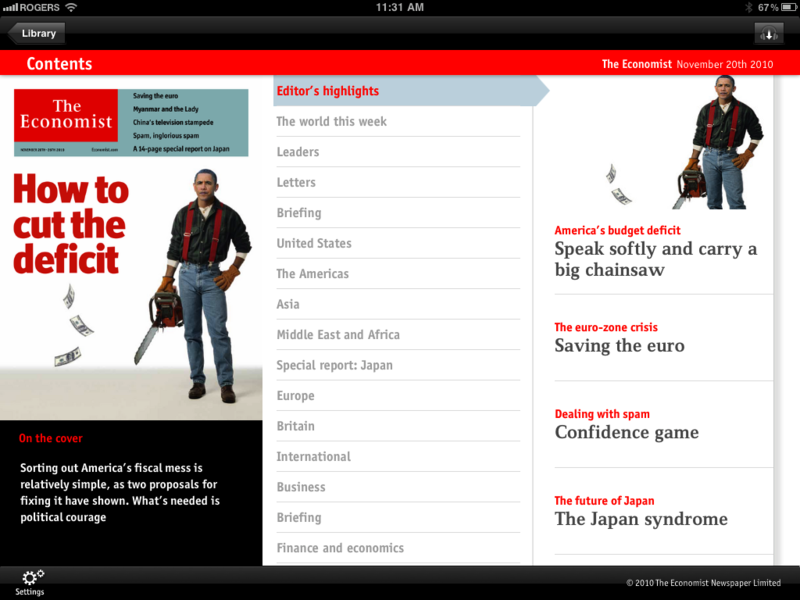 Overall, it’s a nice experience, and easier to read on the iPhone than the Economist’s website. But it doesn’t really take advantage of the platform. Photos and tables that appear in articles can’t be zoomed or expanded, and there doesn’t appear to be any video content. The Economist ignores most of the customizable reading features from other reader apps, and sticks to the very basic black text on white background rubric, without any customization options, including text size adjustment. For my money, I’d rather read The Economist on Kindle (s amzn) hardware, because at least there I have some control over how text appears, and with a text-heavy publication there’s little incentive to check it out on the iPad’s rich media display. But it’s a decent enough start, especially given the audio download feature, so users looking to listen rather than read will be well served. The cost’s easy enough to fix with a print or digital subscription and I get the viewpoint that it’s missing a few bells and whistles but personally I’m really pleased with the app, it really does feel like reading the magazine normally. I’ll definitely be renewing my subscription but probably just digital since there’s really no need for the print edition any more. Yea, the scale adjustment is fine for me. My only complaint is that you can’t highlight and search words in Google or Dictionary. Have you tried pinch to zoom on the text? It works so well, it is nice they have used a built-in feature of multi-touch to removed a few more buttons that normally get in the way of the reading experience. Still, as it says, photos and tables cannot be zoomed. What the hell is wrong with these publishers! I just checked out the Economist site, I can a 12 issue subscription for $1.25 an issue and they want me to pay $5.99 when they have ZERO PRINT AND DISTRIBUTION COSTS!! Are they nuts! I’d love to have this on my iPad but the proper price is a big discount, $0.99 per issue is the right price. If they did that, I’d buy issues of probably a dozen magazines. Instead, I get none, even issues I’d really like, because it feels like they are ripping me off. I understand it costs them something to produce and electronic format, but if they priced it as 99 cents I think they’d get 25 times the sales they get at 5.99. Check the iPhone version, it has both contrast and font size options. Chances are this will come to the iPad version.